EDB to MBOX file converter is a program with which you can convert all the emails from EDB mailboxes into MBOX format. The software with create a single MBOX file for each folder present in an exchange EDB mailboxes. For emails in each folder inbox.mbox, for sent items; sentitems.mbox and so on. 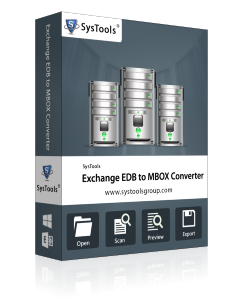 If you need more information please contact the developers of Systools Exchange EDB to MBOX Converter (SysTools Software), or check out their product website.